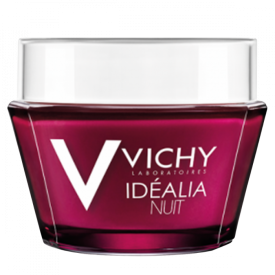 I used to have a bunch of samples of Vichy Idealia Night cream (previously named Vichy Skin Sleep). On applying it seems to absorb quickly, yet gives the skin a slight tingle sensation afterwards. I guess the same notorious dimethicone is in action. And although the skin feels more moisturised at once, the cream doesn't feel totally good on the skin and seems to clog pores. Overall, the skin didn't change or even out and that sticky feeling... In this way, I am not sure what the cream was claiming to do, and although it is not as awful as Vichy Idealia day cream, I could hardly recommend it to use on a day-to-day basis.